DIE Lunæ, 14 die Januarii. Judges to attend this House. White's Petition concerning a Decree in Chancery. Bill to prohibit the Importation of Irish Cattle. Protest against the Word [Nuisance] in it. Message to H. C. for a Conference on Two Bills. Heads for the Conference on the Irish Cattle Bill. Message from H. C. that they agree to the Poll Bill, and Coinage Bill;-- to return the Irish Cattle Bill;--and to remind the Lords of the Public Accompts Bill. The Lord Privy Seal sat Speaker this Day, in the Absence of the Lord Chancellor. The Duke of Bucks reported, "That the Committee of the whole House have considered of the Clause in the Poll Bill concerning the Rating of the Peers; and the Committee have drawn a Clause touching the Peers to be rated by Commissioners of their own." Which, being read, was Agreed to. Hodie 3a vice lecta est Blla, "An Act for selling Part of the Lands of Henry Mildmay Esquire deceased, for Payment of his Debts, and making Provision for his Children." The Question being put, "Whether this Bill shall pass?" 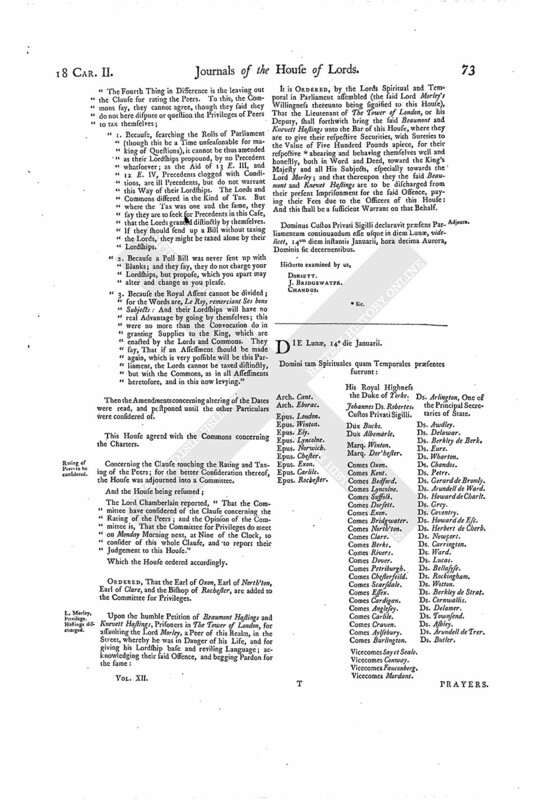 ORDERED, That the Committee for the Bill of Naturalizing Dame Mary Frazer and others, do meet Tomorrow in the Afternoon; and the Committee for the Bill to discover Persons that are dead who have Lives in Estates do meet on Wednesday next, in the Afternoon; and the Lord Newport is added to this Committee. ORDERED, That the Committee for the Bill for rating of Provisions do meet on Wednesday next, at Three in the Afternoon. ORDERED, That To-morrow Morning this House will take into Consideration the Business concerning the Patent granted to the Canary Company. The same Judges are appointed to attend the Committee for the Bill to discover Persons that have Estates of Lives who attend the Committee for the Bill for erecting a Judicature to determine Differences about Houses burned in London. ORDERED, That the Gentleman Usher attending this House do acquaint the Judges, that they attend this House according to their Duty. Upon Consideration had of the humble Petition of William White, Citizen and Haberdasher of London; shewing, "That, by a Decree made by the Master of the Rolls, he is (contrary to the Intent of the said Decree) put out of a Copyhold Estate, purchased of Richard Conquest for a valuable Consideration, by the general Words of the Decree made for all the Lands in the Bill mentioned, most whereof were Freehold:"
It is ORDERED, by the Lords Spiritual and Temporal in Parliament assembled, That it be referred to the Lord Chancellor, to hear both Parties, and to report back to this House whether the Petitioner may be relieved by a Bill of Review. Hodie 3a vice lecta est Billa, "An Act for ascertaining the Bounds of the several Rectories of Swaffham St. Cyriac, and of Swaffham St. Marie's, within the Town of Swaffham Prior, in the County of Cambridge, and for the uniting of the Two Churches there." The Question being put, "Whether to agree with the House of Commons?" "First, Because (as we humbly conceive) the Importation of Irish Cattle is no Nuisance; and therefore we could not consent to call it what it is not. 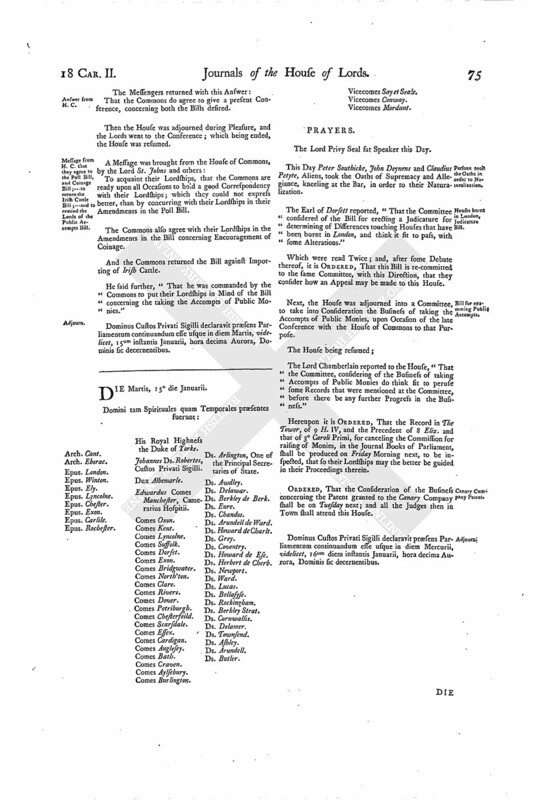 "Secondly, Because the Word Nuisance was professedly designed by the House of Commons to restrain and limit a just, necessary, and ancient Prerogative, inherent in the Crown, for the Good and Safety of His Majesty's People, upon Accidents and Emergencies which cannot be foreseen upon the making of new Laws. "Thirdly, Because there appears no Precedent of any Remedy provided against Nuisances, but by perpetual Laws and removing the Nuisances; whereas this Bill is made but (fn. 1) Probationer, so that, after a while, the Nuisance (if any) will revive. 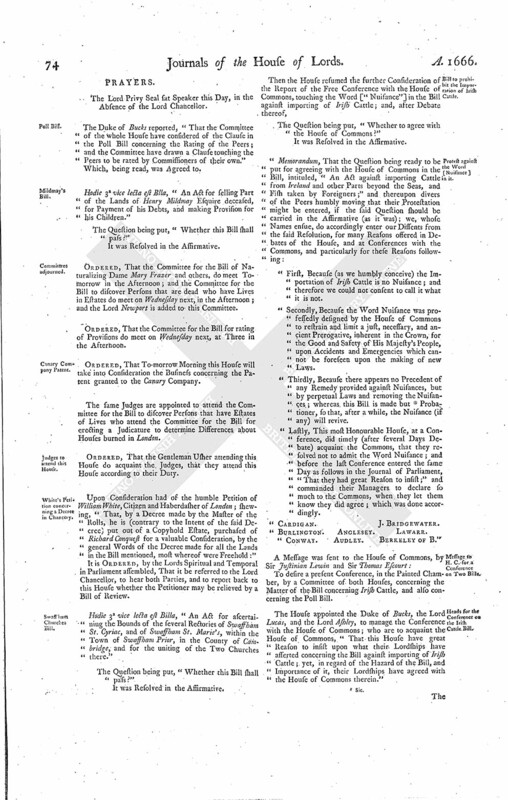 "Lastly, This most Honourable House, at a Conference, did timely (after several Days Debate) acquaint the Commons, that they resolved not to admit the Word Nuisance; and before the last Conference entered the same Days as follows in the Journal of Parliament, "That they had great Reason to insist;" and commanded their Managers to declare so much to the Commons, when they let them know they did agree; which was done accordingly. To desire a present Conference, in the Painted Chamber, by a Committee of both Houses, concerning the Matter of the Bill concerning Irish Cattle, and also concerning the Poll Bill. The House appointed the Duke of Bucks, the Lord Lucas, and the Lord Ashley, to manage the Conference with the House of Commons; who are to acquaint the House of Commons, "That this House have great Reason to insist upon what their Lordships have asserted concerning the Bill against importing of Irish Cattle; yet, in regard of the Hazard of the Bill, and Importance of it, their Lordships have agreed with the House of Commons therein." That the Commons do agree to give a present Conference, concerning both the Bills desired. To acquaint their Lordships, that the Commons are ready upon all Occasions to hold a good Correspondency with their Lordships; which they could not express better, than by concurring with their Lordships in their Amendments in the Poll Bill. The Commons also agree with their Lordships in the Amendments in the Bill concerning Encouragement of Coinage. And the Commons returned the Bill against Importing of Irish Cattle. He said further, "That he was commanded by the Commons to put their Lordships in Mind of the Bill concerning the taking the Accompts of Public Monies." Dominus Custos Privati Sigilli declaravit præsens Parliamentum continuandum esse usque in diem Martis, videlicet, 15um instantis Januarii, hora decima Aurora, Dominis sic decernentibus.